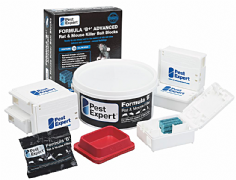 Pest Expert Formula 'B' Mouse Killer Poison is a highly effective professional-grade mouse bait delivering rapid results. Formula 'B' Mouse Killer is the strongest and most effective mouse poison for sale to the amateur market as it contains maximum strength Brodifacoum (0.0029%), which is four times stronger than Bromadiolone when used against mice. Manufactured using only the finest quality whole-wheat grain, Formula 'B' is wax-free, which makes it highly palatable to mice, ensuring excellent uptake and rapid results. Formula 'B' can be used both indoors and outdoors to get rid of mice in gardens, sheds, lofts and kitchens. Formula 'B' is also suitable for mouse control in business premises such as restaurants, food premises, factories and farms. Supplied with nitrile safety gloves for safe handling of poison. 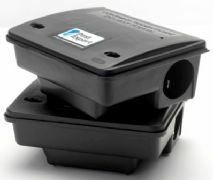 Our heavy-duty lockable Mouse Bait Boxes should be used to securely house the mouse poison. Open each bait box and fill the central chamber with a sachet of Formula 'B'. Close/lock the box and place at intervals where mouse activity has been noticed. Check the bait station every 2-3 days and replenish mouse poison as necessary until no more bait is taken. When using any type of rodenticide, care should always be taken to ensure that it is not accessible to children or non-target species such as pets or other forms of wildlife. For the best value for money, please see our Mouse Poison Kits, which contain two types of poison - Formula 'B' Mouse Killer grain bait and Mouse Bait Blocks – and are supplied with lockable indoor mouse bait stations, bait trays and a professional advice sheet to help you achieve and maintain successful rodent control. Now supplied in easy-to-use 100g measured sachets, enabling precise baiting for improved control. More than satisfied with the Formula B. Having used Pest Expert for various insect issues, I thought I'd give their mouse poison a whirl. It did not disappoint! Definitely the best mouse poison I've used! The eat it, they die - simple as that! Fantastic product! Fantastic poison! Within a week, the little family of mice had totally disappeared - just what I needed after they were starting to chew the wires! Good price and the poison works! Excellent speedy service, well packaged and exactly what I ordered. Currier was efficient. I knew when he was calling with the order and a photo told me where he’d left it. Shall definitely order from here again. The poison worked a treat too! Great poison! The mice were eating it the first night put it out and within days, the signs of mice had disappeared! Would definitely recommend the Formula B! Excellent Service. The order was dealt with promptly and delivered in a few days. Far quicker than I expected. Haven't seen any evidence of mice since we used your products!! Put grain and blocks down the evening before we went away for a few days. No sign of mice when we returned., but we did hear the neighbours young son commenting that his mum had found a dead mouse in her shoe!! Very good service and fast delivery Excellent service and fast secure delivery, highly recommended. No problems at all with the Company. Too early to tell if the poison is effective though. Just hope the local mice/rodents die before my 1 kg of poison runs out. We're on the edge of the countryside, and the mice problem is in the garden, following recent building/ground clearance of a wild patch of ground. I haven't found any actual poisoned dead rodents, and though absence of evidence is not evidence of absence, I am a little concerned that the poison is still being eaten a week later. I'm hoping it's not the same rodents returning. Time will tell.